Spring has long held the position of muse to many artists and writers, inspiring them with thoughts of renewal, love and growth. It symbolises a time of rebirth and motivation – what better time to get married and begin your new life as a couple taking the next step together, creating a new family and celebrating your love for each other? 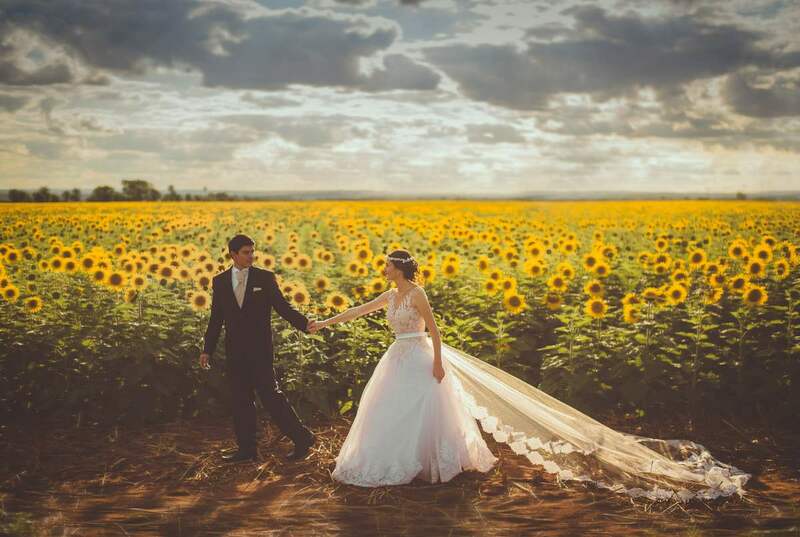 Having a wedding during this wonderful time of year can offer you countless advantages, such as the warm, but not stifling, temperature. It means that you can host your guests outdoors, perhaps in a lush garden that truly embodies the season. 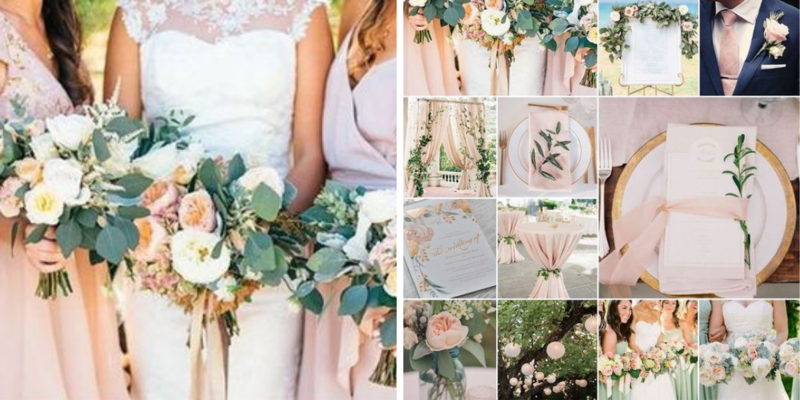 A spring wedding also means you can incorporate light and sheer fabrics touch of wood and playful petals into your decorative elements to set a truly romantic scene. If you plan on tying the knot in springtime, take advantage of the season’s beauty and let nature influence your wedding colour scheme. This blog will give you a few ideas to make your day an elegant, bright and festive occasion that will have you gushing over the memory of its understated elegance for years to come. If you aren’t one for bright, spring hues, go for a tasteful and neutral grey palette. You can soften the cold colour by utilising feminine fabrics, such as silk, satin and lace. Consider contrasting it against hints of sage and brightening it up with shades of white. Grey doesn’t necessarily translate into drab and boring. On the contrary, grey could give your wedding a fashionable, yet refined aesthetic that would be more striking than a bold colour scheme. If you’re afraid of your wedding looking too dull, dazzle it up with sparkling elements, such as crystal ornaments as centrepieces, edible glitter on your dessert table, a glamorous shimmering backdrop and delicate brooches to adorn your bridesmaids. Some of us have had our fill of grey over the winter period and, instead, would like to celebrate the upcoming months of sunshine with bold splashes of bright shades that are youthful and embody the states of happiness and sheer joy. When opting for a bright colour palette the combinations and possibilities are endless. Here are a few interesting ideas to give you a taste of what is imaginable. This cute and colourful combo is as edgy as you can get! This colour palette signifies a young, modern and, most of all, daring couple. Floral arrangements will stand out easily against wooden pews and create a lovely contrast against wedding dresses of various shades of white. In fact, it works best when balanced with at least one more neutral shade like ivory or sand. Take some tips from nature and incorporate fresh fruit that matches the colour scheme to your dessert table and a signature cocktail. Think strawberries, cherries and pomegranates – yum! 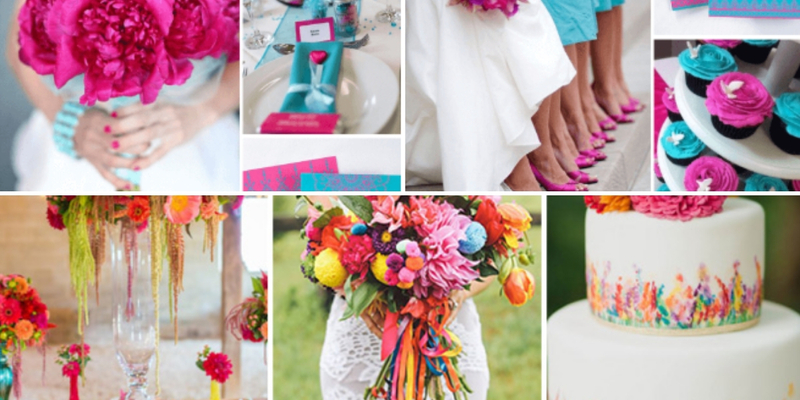 This beautifully fearless colour palette is a magnificent choice for a sunny day wedding, especially one held outdoors. It will suit a garden theme effortlessly as it is truly inspired by springtime, boldly feathered birds and our treasured sun. Canary is a vibrant colour that could enhance the appeal of your decor by including some canary-coloured lounge furniture or, if that feels like too much, use throws and cushions of that shade instead. It will be fabulously instagrammable! Elements of artichoke can be incorporated into the decor, too. Use succulents and vines for a rustic centrepiece or have them drape over your bar. The combination of the two tints is sure to appear balanced and complementary, bright and exuberant. When the Spring Equinox comes around, we begin hearing words like ‘pastel’, ‘powder’, or ‘dusty’ in reference to the kind of colours expected to be in vogue for the season. When used correctly, soft palettes of blue, green, pink or purple could create an incredibly enchanting atmosphere suggestive of a delightful and mystical celebration. Colours like sage and peony are soft and romantic, enhancing a delicate and lovely atmosphere with sophistication and style. You could add touches of rose gold to give it that something extra, whether it is in the calligraphy on your invitations, metallic details in your dress, or a chic feature on your cake. 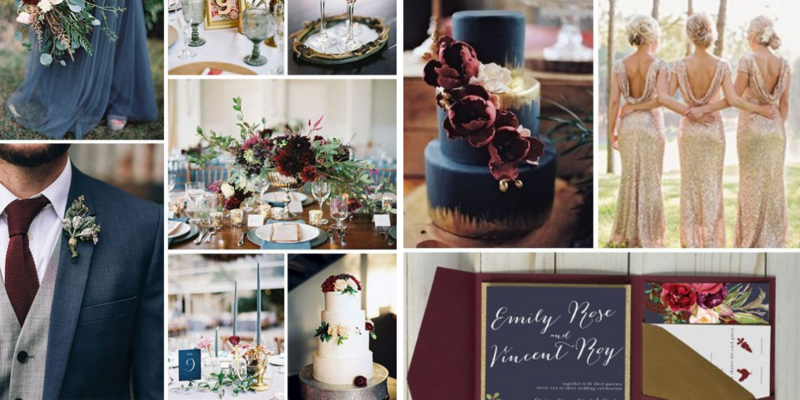 This colour palette is versatile and could flatter many different styles, either a rustic wedding or a modern one. This one is for the couples out there that don’t follow the archetypal “bright and joyful” rules of the season but would rather opt for a darker, and perhaps sexier, version of a spring wedding. Perhaps canary and poppy doesn’t reflect your personalities as individuals, nor as a couple. If that’s the case, you should not have to feel limited when choosing your colour scheme for a celebration that is all about you! Dark colour palettes are gaining ground and look absolutely stunning. They appear extremely modern and create a rich, intimate and alluring climate. Play around with combinations such as eggplant and black, navy or midnight blue with hints of mint, or an earthy marsala and blush rose. There are no limits to your unique colour expression. If you or someone you love is planning a wedding, contact the reliable style experts at Sarah Young. She and her team have the eye and experience to guide you and make planning your special day easier. They will take your ideas and turn them into a reality you never thought could be so magical, reflective of you as a couple and never losing the warm, personal touch we all love to see at weddings.